Other World Computing (OWC), a component supplier that specializes in Apple products, has made available dedicated SSDs designed to replace existing factory SSDs in the 2010-2011 lineup of MacBook Airs. Called the Mercury Aura Pro Express 6G, the new NAND drive incorporates a SandForce 2281 controller, supports SATA III speeds for up to 6Gb/s (2011 MBAs only) and is AES-compliant for 256-bit data encryption. According to the manufacturer, the drive is “the industry’s first 6G SSD upgrade for the 2011 Apple MacBook Air 11.1” and 13.3” models.” Overall, the listed maximum sustained read and write speeds are at 507MB/s and 454MB/s, respectively, which AnandTech mentions is around 2x as fast as the Samsung SSDs currently found in many of the new MBA models. The new Express 6G lineup succeeds the original Express lineup, which lacks 256-bit data encryption and has been built to take advantage of SATA II speeds at the most. The OWC SSDs can now be bought online, but be prepared to pay a bit more compared to other common notebook-sized SSDs. The 120GB model currently retails for $349, while the 240GB model runs for an even heftier $599. The premium price may be worth upgrading for users constantly running disk-intensive tasks and could use the additional capacity, but is likely not worth the purchase for regular users running everyday tasks. September 15, 2011 Woodstock, IL -- Other World Computing (OWC®) http://www.macsales.com, a leading zero emissions Mac® and PC technology company, announced today the industry’s first 6G SSD upgrade for the 2011 Apple MacBook Air 11.1" and 13.3"models. The new OWC Mercury Aura™ Pro Express 6G SSDs combine award-winning SandForce® technologies and Tier 1/Grade A Toggle Synchronous NAND to deliver data rates that are more than 3x faster and capacities that are up to 4x greater than factory available SSD options. 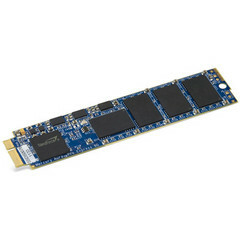 Currently available in two sizes--120GB and 240GB--the new 6Gb/s SATA 3.0 Revision models continue OWC’s position as the only alternative to factory SSD options for the 2010-2011 MacBook Air. 3G speed models from OWC are also available in capacities of up to 480GB. The OWC Mercury Aura Pro Express 6G offers 2011 MacBook Air owners a cost-effective SSD upgrade path that delivers higher performance, functionality, and reliability over the factory installed SSD. Because the Mercury Aura Pro Express 6G SSD is SATA Revision 3.0 (6Gb/s) compatible, it can take advantage of the 2011 MacBook Air’s built-in 6Gb/s SATA data bus to deliver peak, sustained data rates over 500MB/s, versus the factory installed SSDs, which are limited by SATA Revision 2.0 (3Gb/s) capability. While ordinary SSDs initially offer fast read/write performance; they experience significant write speed degradation over repeated usage. Independent simulation tests conducted by leading drive performance experts like MacPerformanceGuide confirm OWC Mercury SSD’s ultra-efficient Block Management & Wear Leveling technologies are able to eliminate virtually any reduction in data transfer speeds over heavy, long-term usage without dependency on less-than-effective OS TRIM management. Utilizing SandForce DuraClass™ technology, the OWC Mercury Aura Pro Express 6G provides an increase of up to 100X in data protection, compared to ordinary SSDs and leading enterprise-class hard disk drives. By combining the highest level of Error Correction Code (ECC) and SandForce RAISE™ (Redundant Array of Independent Silicon Elements) technology, along with 7% over provisioning, the Mercury Aura Pro Express 6G provides RAID-like data protection and reliability without loss of transfer speed due to parity. OWC’s new Mercury Aura Pro Express 6G leverages the proven success of its previously released 3G model. 2010-2011 MacBook Air owners seeking maximum storage/backup capacity can replace their factory installed SSD with up to 8x greater capacity offered by the OWC Mercury Aura Pro Express 3G SSD. Available in capacities up to 480GB, the 3G model SSD also delivers up to 68% faster performance in real world use. OWC’s industry awards and recognition include: Crain’s Chicago Business 2009 and 2011 “Fast 50” List of 50 Fastest Growing Companies in the Chicago Area; Inc. 5,000 “Fastest Growing Privately Owned Companies in America” honoree 2007-2010; Reseller Ratings Elite Member 2009 & 2010; Better Business Bureau Top Rating of A+ 2010-2011; Reflex Packaging Commitment to Excellence Recycling Award 2009; Computerworld Magazine Top Green-IT Companies for 2008; and McHenry County Economic Development Corporation 2008 Business Champion Award. In March 2010, OWC’s corporate campus was designated as LEED® Platinum by the Green Building Certification Institute (http://eshop.macsales.com/green/index.html). Platinum is the highest achievable LEED (Leadership in Energy and Environmental Design) Program level, which began in 1998. Out of more than 14,000 LEED projects engaged worldwide since the program's inception, OWC is one of less than three hundred to achieve the Platinum standard. In September 2010, OWC’s headquarters earned the U.S. Environmental Protection Agency (EPA) ENERGY STAR® rating for building operations that perform in the top 25 percent of similar facilities nationwide for energy efficiency. OWC is a registered trademark; and OWC Mercury SSD is a trademark of New Concepts Development Corporation. SandForce is a registered trademark and SandForce Driven is a trademark of SandForce, Inc.
Apple, Mac, MacBook, MacBook Air, PowerPC, iPod, iPhone, and iPad are the trademarks of Apple, Inc. All other trademarks or registered trademarks are the property of their respectful owners.